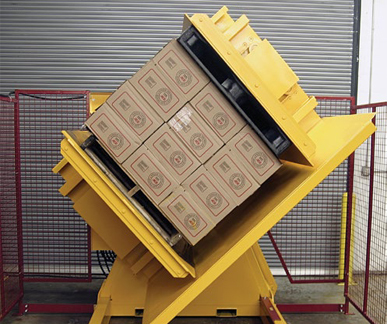 Optimum’s Pal-Tec PT1600 Single Clamp Pallets Inverter offers a faster, easier and more cost effective way to rotate, switch or transfer loads and replace broken pallets. 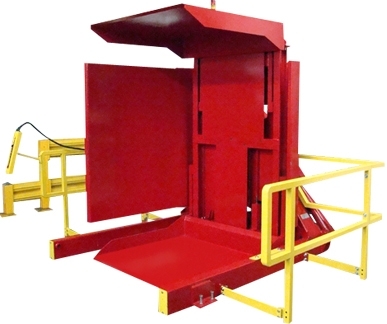 Designed to invert or transfer loads ranging from 920 mm to 1600 mm. 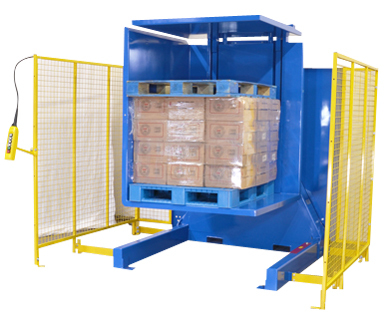 Optimum’s Pal-Tec Pallet Inverter is ideal for boxed, bagged or canned goods and is versatile enough to handle from yoghurt and biscuits to bottles of wine or cement. 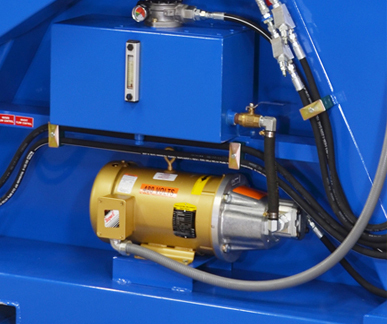 It is a free standing 180° inverter with a single clamping plate that will handle any load up to 2000kg with ease. If you'd like more information or if you have any enquiries about the Pallet Inverter - PT1600, please call 1800 066 008 or click HERE to contact us online and we will contact you. 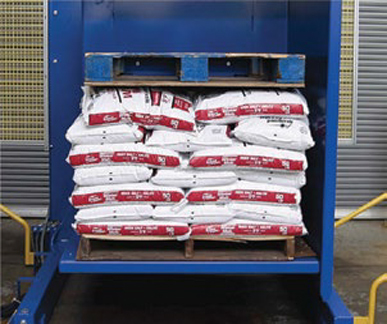 Optimum’s Pal-Tec Pallets Inverter is ideal for boxed, bagged or canned goods and is versatile enough to handle from yoghurt and biscuits to bottles of wine or cement. It is a free standing 180° inverter with a single clamping plate that will handle any load up to 2000kg with ease. If you'd like more information or if you have any enquiries about the Pallet Inverter - PT1900, please call 1800 066 008 or click HERE to contact us online and we will contact you. 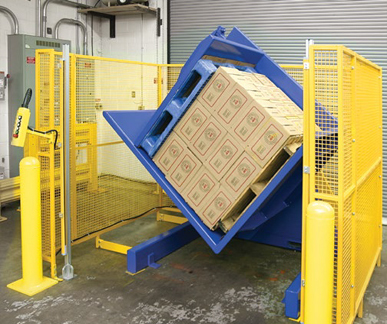 Optimum’s Pal-Tec PT2200 Single Clamp Pallet Inverter offers a faster, easier and more cost effective way to rotate, switch or transfer loads and replace broken pallets. 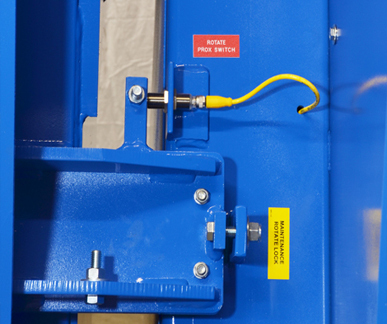 Designed to invert or transfer loads ranging from 1130 mm to 2200 mm. If you'd like more information or if you have any enquiries about the Pallet Inverter - PT2200, please call 1800 066 008 or click HERE to contact us online and we will contact you. 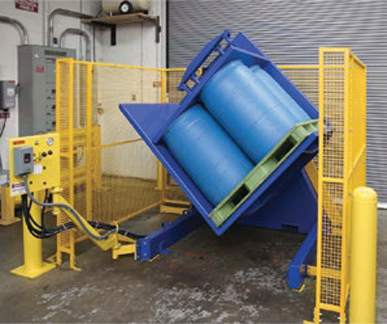 Optimum’s Pal-Tec Dual Clamp Pallets Inverter offers a faster, easier way to rotate, switch or transfer loads and replace broken pallets. 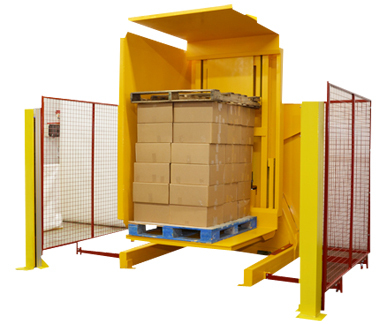 The Dual clamp pallet inverter adds greater flexibility when handling a wide range of products in varying heights. 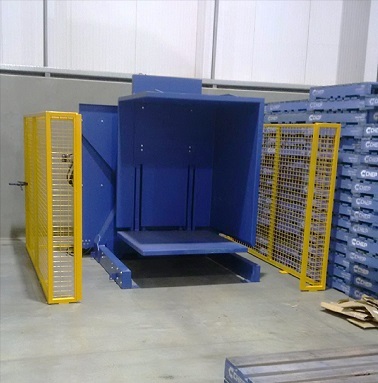 Two moving tables are balanced providing load stability for tall loads up to 2400 mm or down to 1400 mm in compact footprint. These inverters are operated via push button or radio remote controls. Dual clamping plates travel in unison, near perfect center balance provides stable inversion of tall loads up to 2400mm or short partial loads down to 1400 mm. The typical uses of these inverters can be seen in the areas of food ingredients, bakery, fertilizer, and pharmaceutical plants or inbound load transfers where a variety of products may be handled: boxes, drums and packaging material. If you'd like more information or if you have any enquiries about the Dual Clamp Pallet Inverter, please call 1800 066 008 or click HERE to contact us online and we will contact you. Optimum’s Pal-Tec Floor Level Pallet Inverter offers pallet truck entry for fast, easy load transfers and product inversion. 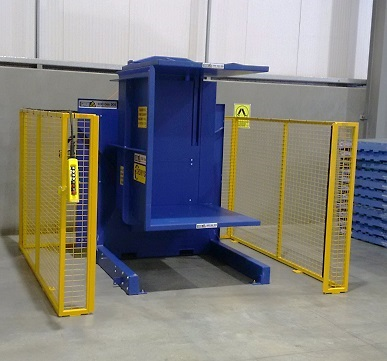 Floor Level Loading pallet inverters are meant for areas with restricted access to forklift trucks. 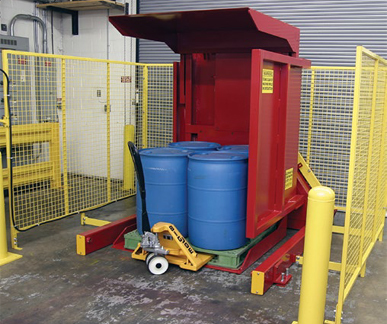 Beveled plates allow effortless loading and unloading with a manual or electric pallet truck, no ramp required. These inverters are operated via push button or radio remote controls. 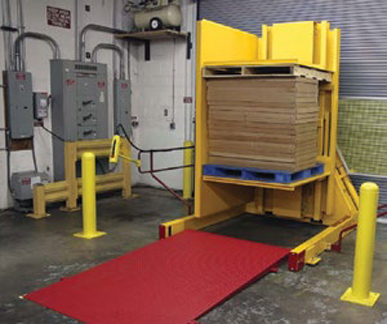 Pallet Inverter’s compact footprint and floor level access is best suited for staging areas near clean rooms and production areas or where forklift use is prohibited. 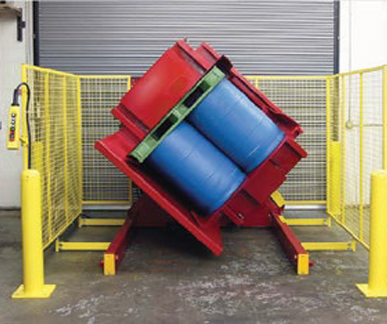 Dual clamping plates travel in unison, near perfect center balance provides stable inversion of tall or short partial loads. If you'd like more information or if you have any enquiries about the Floor Level Pallet Inverter, please call 1800 066 008 or click HERE to contact us online and we will contact you.